Like any many other schools in Ireland, Educate Together schools are state-funded and teach the National Curriculum. They are non-fee-paying schools and are open to students of all backgrounds. They are co-educational and have no school uniforms. 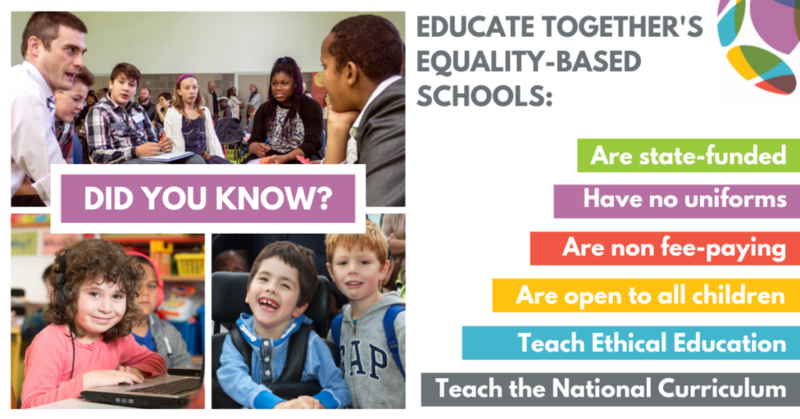 But they are much more than that: Educate Together schools work hard to instil a sense of equality and justice in students. They embrace the input of parents, students, staff and the wider community to improve the school in every way possible. They are committed to enabling students to achieve their full potential. All students are encouraged to explore their full range of abilities and are provided with equal opportunities regardless of their identity. Educate Together schools put students at the heart of all policies and practices. All children have equal access to school and no one religion or worldview is given priority over another in Educate Together schools. As a school patron, Educate Together operates a national network of 84 primary schools and 13 second-level schools in Ireland, catering to over 25,000 students. The growth in the Educate Together school network continues to be driven by parental demand and the Educate Together national office supports the rights of families to access the education they want for their children. For over 40 years, Educate Together has been working to establish inspirational schools for children and young people in Ireland. The movement has its roots in the Dalkey School Project, a pioneering national school which was established in 1978. Ethical Education is a key component of the Educate Together model; it’s a curriculum that is living in Ireland’s equality-based schools and it seeks to offer students the opportunity to meaningfully and critically reflect upon the world around them. At primary level, our Learn Together Ethical Education Curriculum is taught alongside the National Curriculum. Learn Together includes learning about morality and spirituality; equality and justice; belief systems and an ethical approach to the environment. Learn Together replaces religious instruction and teaches students about different belief systems as well as atheism, agnosticism and humanism, without promoting any one worldview over another. At second-level, students follow a similar Ethical Education Curriculum, which includes themes on values, worldviews and belief systems, global citizenship education, diversity, migration and equality. As a charity and independent NGO, Educate Together often needs volunteers, donations and support.